I’ve decided to revive my blog! I sort of let things trail off last year when my life got super busy, but recently I have had so many moments where I thought to myself “that would be such a good blog post!” that I just had to start back up. Since I last blogged I have moved into a purchasing position with Jimmy Beans Wool. Yes, that means I literally buy yarn for a living all day, though not with my own money of course! It is a super exciting job for a person like me, because I get to see what is new before it hits the market. I also have a small bit of influence over what we will and will not carry, and occasionally I am just forced to do research on Ravelry and by reading blogs. I know, it’s a hard life! In the last few months I have decided to give knitting pattern design a try. I have flirted with the idea before and certainly gone off-pattern for easy designs, but now I want to give it a real effort. This is in part because I have already had a couple designs accepted for publication (coming later this year and next!). But it is also because sometimes I am smacked in the face by inspiration and just have to put what’s in my head down on paper. I suppose it is becoming my latest way for creative release. Unfortunately pretty much all personal knitting has been set aside in favor of designing. At first I thought this would make me sad, but it turns out that I am just as happy knitting my own designs as I am knitting someone else’s. I guess I am more of a “process” knitter than I thought! With designing, more than anything else, I worry about rejection. It’s a hard thing to do, putting yourself out into the world, and hoping that people will like and accept what you have created. I must admit that having a couple acceptances under my belt definitely boosts my confidence, but that’s not to say I haven’t been turned down! I certainly have and if there is one thing I have learned so far, it is to not feel bad or take it personally! Rejection, as it turns out, is part of the process and I am doing my best to learn from it. For example, I didn’t completely read the instructions for one of the design submissions and I was over the yardage allowance. Of course that one was turned down! And you can bet I will carefully read all submission guidelines from now on. It helps that I work somewhere that is very supportive of my decision to try and launch an independent design career. I am excited to say that earlier this month JBW released my first design, the Spangled Tote. 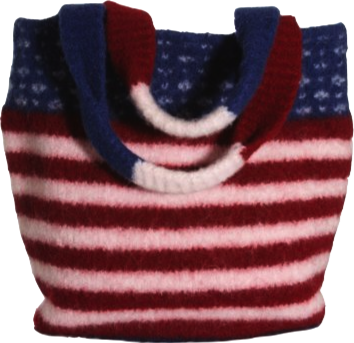 As you can imagine, it is knit in red, white, and blue and is representative of an American Flag. 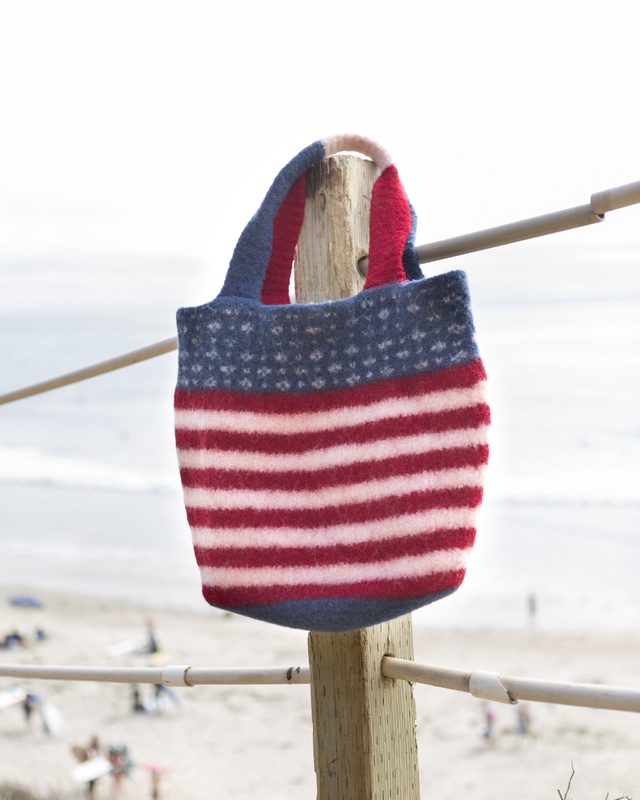 And of course it is felted which makes it nice and sturdy for carrying around all your summertime accessories. I used Cascade 220, but any wosted weight 100% feltable wool will do! Also, if the flag design is not really your thing, you could totally knit it in a solid color, or stripe two colors all the way to the top. The possibilities are endless! You can download the pattern for free here, or purchase the kit with everything you need to make the flag version here! There is also a matching crocheted water bottle sling to go with it designed by one of my wonderful co-workers.